Here’s my quandary with this bread: the recipe is from Balthazar Bakery in NYC, and I have really been trying to avoid any sort of copyright infringement with the recipes. I usually adapt them somehow, and always credit my source. If a recipe is changed significantly, I call it my own. 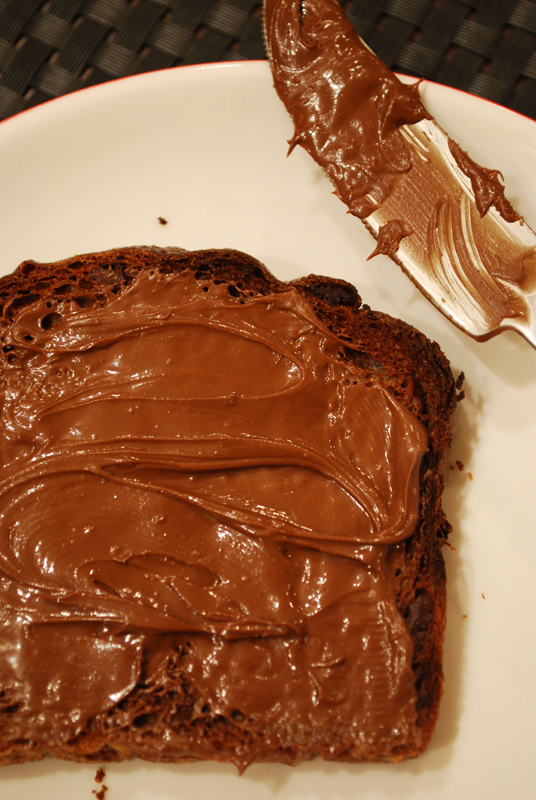 I’m sure most of you have had a chocolate-filled croissant, a chocolate-chip muffin, bread with Nutella, or any other variation on the “chocolate + bread = delicious” equation. But this bread absolutely takes the cake (no pun intended). There’s just a bit of cocoa powder mixed in with the flour to highlight and deepen the chocolate flavor, most of which comes from the kneaded-in bits of good dark chocolate. It’s the best of all possible worlds: yeast bread with good chocolate mixed in. But technically speaking, it’s a complex and carefully constructed bread. First, there’s a sourdough starter used, which lends depth of flavor and long-keeping qualities (aided also by the sugar used). Second, there’s an autolyse period; which, if you recall from an earlier discussion, is one of the easiest ways to improve the texture of any bread. It also has a long, slow rise, giving the yeast plenty of time to create all those lovely acids that bring such depth of flavor to the dough. And on top of all that, you knead chocolate into the dough! Heaven! The flavor of the chocolate you use is fairly prominent, so be sure to use a good one – that means no Hershey’s Bars, please. And the darker the chocolate (or, the higher the cocoa percentage on the label), the more bitter and rich it will taste. I used a 72% chocolate (my usual baking chocolate; I love dark! ), but in retrospect, I think a 65% or 60% (or semisweet) might have been a little better. Unlike in cookies or cakes or some mousses, there isn’t much sugar here to temper the bitterness of a dark chocolate. And after baking for 45 minutes, the chocolate will take on a deeper, more “roasted” flavor. Of course, if you prefer milk chocolate, that would work just as well. There’s no wrong answer when it comes to good chocolate. One last note: as decandent and over-the-top it was to eat a slice of this bread with Nutella, it was fantastically delicious dipped into a good olive oil. And if you’ve never tried quality olive oil and chocolate together, my friend, you just haven’t lived. I could eat a bucket of that stuff. 1. To make starter, dissolve the yeast in the warm water. Stir in the flour until completely incorporated. Lover loosely and let sit 4 to 6 hours at room temperature. After this time, store in an airtight container in the refrigerator. 2. To make the dough, combine the yeast, flour, cocoa, sugar, water, and starter in the bowl of a stand mixer. Using the dough hook, mix on low speed until a rough dough forms. Cover the bowl, leaving it on the mixer, and let rest for 15 minutes. 3. Uncover the bowl. Add the salt and butter in pieces, mixing at medium-low speed, until the dough develops a sheen, about 10 minutes. 4. Add the chocolate, and continue mixing on medium speed until incorporated, about 2 minutes. 5. Transfer the dough to a lightly-oiled bowl, turning to coat all sides. Cover with plastic wrap and let rise until doubled in size, about 2 1/2 to 3 hours. 6. Turn out the dough onto a lightly-floured surface, and fold in thirds, like a letter. Cover with plastic wrap and let rest 20 minutes. Meanwhile, butter two 7x3x2-inch loaf pans, and dust with additional sugar, knocking out extra. 7. Divide dough in half, and divide each half into 4 equal sections. Round each portion into a smooth ball, and place 4 into each prepared loaf pan, smooth side up. Cover with plastic wrap, and let rise until doubled again, about 1 1/2 to 2 hours. 8. Preheat oven to 350º F. Position rack in the center of the oven. Beat the egg yolk with the cream to make an egg wash. When the loaves have fully risen, gently brush them with the egg wash, taking care not to deflate them. Sprinkle the demerara sugar over the top. 9. Bake loaves at 350º F for 40 to 45 minutes, or until fully baked. Turn out onto a wire rack to cool completely. Chocolate bread will keep, in an airtight container, up to 3 days, and will freeze well for about 1 month. 1. If you’re lucky enough to have one, you of course can feel free to use any bread starter you may have on hand, instead of making a new one. If you make the starter listed here, and would like to keep it going, feed it once a week with 1/4 cup flour and 1/4 cup water. Whisk it all together until smooth, let stand at room temperature until bubbly, and refrigerate again. 2. I highly recommend using a quality chocolate in this recipe, as the flavor is very evident. 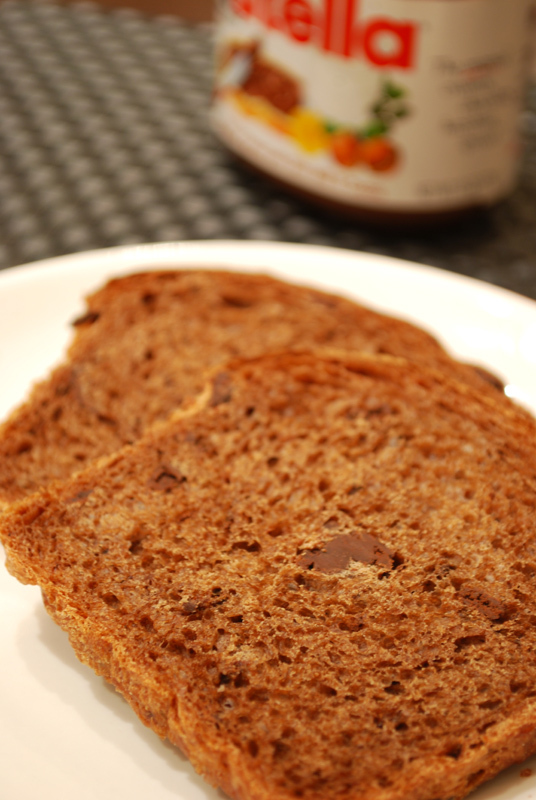 The chocolate should melt into the bread a little, which will not happen with chocolate chips. 3. Demerara or turbinado sugar can be often found in the baking aisle, where it can also be called “Sugar in the Raw”. Brown sugar is not a good substitute, as it will simply melt away in the heat of the oven.